Today’s post will be a brief one. We are preparing for a birthday party to be given in honour of a friend, tomorrow. Guests will be encouraged to wear their summer whites before they have to pack them away for the season. We have a lot to do before then. Silver to polish, napkins to iron, glasses to polish and a trip to the booze store to replenish the stock that has dwindled this summer. The menu will include tarragon chicken salad, roast beef and blue cheese finger sandwiches, a crab ball, salmon tartare, steamed shrimp and an awful lot of champagne. What does all this have to do with the Chinese rice bowls above? How else do you serve olives, Virginia peanuts or cheese biscuits to the crowd? I think they are stylish, colourful and somewhat unusual. And, since they are tremendously inexpensive, very practical. Do you use crystal bowls? Ceramics? Julep cups? What are your secretly inexpensive and stylish serving vessels? This entry was posted in Entertaining and tagged Chinese bowls, parties, pottery. Bookmark the permalink. I love white china but for serving dishes, give me color and fun little dishes. I have some hand painted bowls that I adore. We have a number of friends who are potters so we are always buying small bowls from them — usually in earthy colors. Also lots of blue and whites to go with the everyday white dishes. Great menu — though I did just see an article warning against salmon tartare (NY TImes, perhaps). It’s a dish I love and have made which is why the story caught my eye, but not enough to remember the facts I guess! For casual entertaining we also use Asian bowls, both Chinese and Japanese. 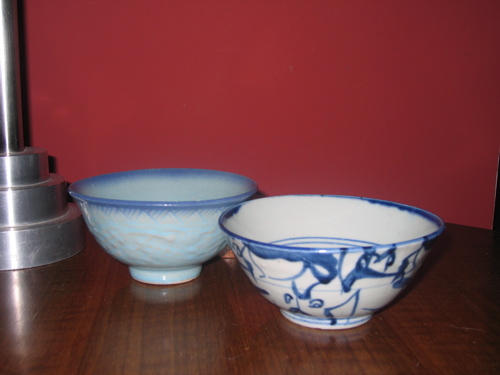 Many of our Chinese bowls were purchased at Pearl River here in NYC at astonishingly inexpensive prices. We eschew blue and white for them, concentrating rather on earth tones — green, brown, slate blue and similar. For less casual entertaining we use small silver bowls that we have picked up over the years at Antiques Shows and the like, also the silver porringer that was my baby bowl, which makes a nifty nut dish.